As the calendar moves into fall, appetites change from salads and BBQ to soups and casseroles. 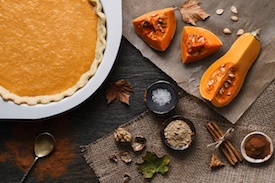 Add these simple and tasty recipes to your collection for some quick and satisfying fall meals in your apartment home. This recipe from Rachael Ray, queen of the 30-minute meals, provides hearty comfort food for cooler days. Crumble one pound of Italian sausage and brown in a skillet. Add 1/2-cup each of water and heavy cream. Cook till reduced by half. Toss kale in the sausage mixture until wilted, then toss with one pound of fettuccine cooked al dente. Top with grated Parmesan. Meals don't have to include meat to be filling. This fall favorite gets a kick from a zesty blend of spices. Cook chopped onions and bell peppers until soft, then add cumin, chili powder, cayenne and minced garlic. Add one can of whole tomatoes, using a wooden spoon to gently break them. Add one can each of pinto, black and kidney beans with 2-1/2 cups of water and simmer until thick. Garnish with sour cream, shredded Cheddar and cilantro. Make fresh tortilla chips by brushing corn tortillas with butter or oil and baking at 400°F until crispy. Salt to taste and break into pieces when cool. A slow cooker is a must-have for fall meal preparation. Skip the take-out and make your own Chinese dinner! Cook boneless/skinless chicken breasts with Thai chilies on low for six hours. Drain the juices, then cut the chicken into cubes and put back in the slow cooker. Pour store-bought General Tso sauce over the chicken and cook on high for 30 minutes. Serve over rice and garnish with green onions and sesame seeds. Chopsticks are optional! Apple is a classic fall flavor, and ginger makes a nice complement in this refreshing beverage. Make the base by juicing a six-ounce piece of ginger and combining with vinegar, maple syrup and lime juice. Stir until the syrup is dissolved, then chill until cold. Dilute with water to taste and serve in ice-filled glasses with a sprig of mint. These no-bake cookies are fun for kids to make, and just as much fun to eat. Melt one cup butterscotch chips, 1/2-cup peanut butter chips and 1 Tbsp shortening in a microwave just until smooth. Stir in 1-1/2 cups chow mein noodles and use teaspoons to drop "stacks" onto a wax paper-lined cookie sheet. Let stand until firm and store in the refrigerator. Make a variation by substituting chocolate chips for butterscotch. What's your favorite fall beverage? Do you prefer hot chocolate, spiced cider, or another specialty drink? Cast your vote in the comments!